This production of Kevin Elyot’s Coming Clean, originating at the King’s Head in 2017, is something of a headscratcher. This isn’t on account of the play itself, which is comfy, affectionate and thoughtful early work by the author of My Night With Reg (and has the unmistakable ‘first play’ feeling to it) but the slightly puzzling West End transfer of this production to Trafalgar Studios. In a cosy but slightly dingy Kentish Town flat, a group of young gay men squabble, eat jammy doughnuts and fumblingly love each other. This is Tony (Lee Knight) and Greg’s (Stanton Plummer-Cambridge, a great name) home, but their friend William (a gregarious Elliot Hadley) often installs himself too. Invited in as a cleaner is the young, twinky Robert (Tom Lambert), and it’s clear that his entrance marks the throwing of a grenade into Tony and Greg’s relationship of five years. The gleeful conversations between the irrepressible William and Tony on cruising and clubbing are funny and ring true with a gay audience more than thirty years after the play’s debut at the Bush: William hooks up frequently, on the hunt for some trade, but is disappointed by a “virile forty” one night stand revealing himself more as “a limp fifty”. In the rules of their relationship, there’s room for Greg and Tony to engage in a bit of fun on the side too, which seems to make sense. Before we see the two in their first scene together, it’s hard to imagine why the severe Greg and more gentle, witty Tony stay together, but the actors sell it, despite their sniping at each other, with their easy physicality, automatically winding arms around each other on the sofa. As things get itchier and itchier in the living room’s tiny space, Robert – seemingly unwittingly – inserts himself into the couple’s midst, but his intentions aren’t really allowed to matter too much in Coming Clean’s tight formula. Robert remains a pretty ingenue, defined by his destabilising desires (for music already regarded as sacred between the couple, and for one of them too), an aspiring actor with flushed cheeks, and it’s the choices made with regards to him by Tony and Greg which matter. Insinuated by both is that one of them is being selfish, but which impulse is the worse: to want to have your relationship and more besides and have your partner be accepting, or to have your possessive feelings over your partner be recognised and observed? Elyot shows us a couple whose creative, sexual and emotional lives are becoming more and more separate. Robert is almost the least of it. The unchanging set of the flat (designed by Amanda Mascarenhas) fills Studio 2 to brimming with detail; it’s post-decriminalisation, pre-AIDS, and we’re shown things aren’t quite safe, but they’re allowed to be domestic. A record player which comes to be key, a hanging Queen Elizabeth mat and a beaded curtain are contrasted with William’s experience of a hook-up’s horrific flat with too many plants everywhere, like an attack of the Triffids. He might not recognise our idea of interior decorating now, but our tastes haven’t completely changed; Greg and Tony’s issue is still one I think plenty of gay couples face down, particularly as gay relationships continue to be more often open than straight ones. As the two become messier and more bitter, the actors (particularly Knight, the more vulnerable of the two) grow stronger, and the slightly expository early explaining of their sexual dynamic to William is more easily forgiven. Less so Adam Spreadbury-Maher’s direction, which is a little stiff rather than nimble: the cast stay in character for the long scene transitions, but as they’re so long, why not keep the lights up so we can see them? The copious amount of cigarettes smoked by the cast combine with the confines of Studio 2 as they might not have at the King’s Head to cause several members of the audience to cough, and they seem often a crutch for the actors, otherwise often moving props around a little aimlessly. Despite this play showcasing the most sexual excitement there’s ever been over a man named Greg, the direction contributes to a sense of the production never quite lifting itself into something more substantial, or the arena of Elyot’s later writing: it’s straightforward and fun to be in, still pertinent without being hugely memorable. 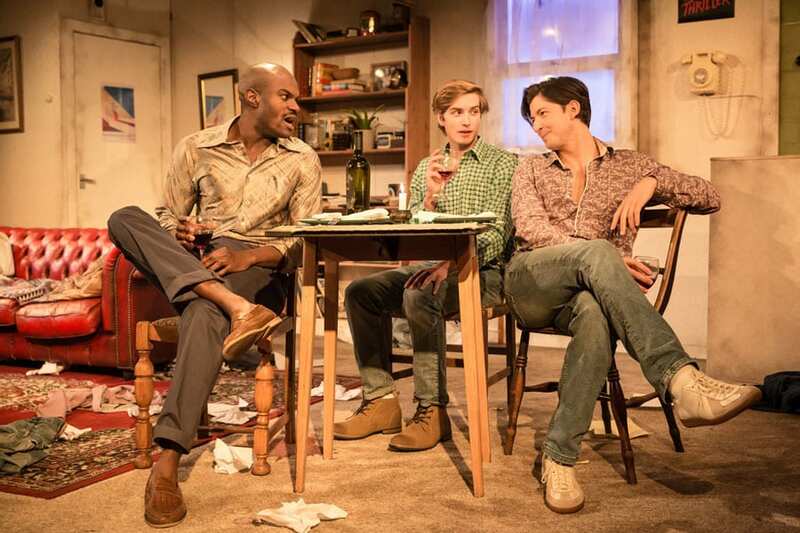 Coming Clean is on at Trafalgar Studios until 2nd February. More info and tickets here.